Due to a court ruling in UK which favours the British broadcaster BSkyB, Microsoft was asked to change the name of its SkyDrive cloud-based storage service last year. 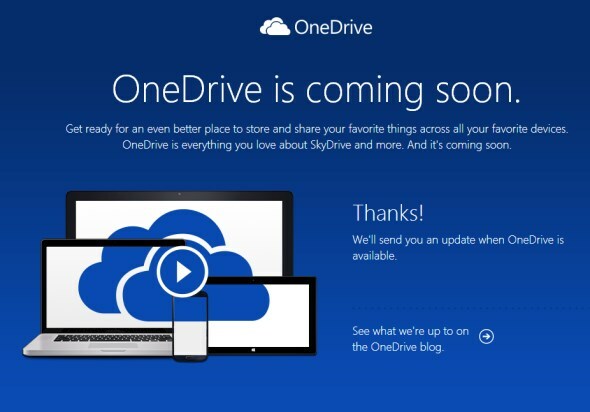 Six months after that took place, now we finally know what the new name is going to be: OneDrive. The new name is confirmed by Ryan Gavin, General Manager at Consumer Apps & Services of Microsoft over at OneDrive’s blog. For now, SkyDrive is still operational as it is but Ryan has assured that the service will continue to operate as usual once the name switch takes place soon. Additionally, the SkyDrive Pro name will also be switched to OneDrive for Business. Users are now able to register their interest at OneDrive’s preview website right over here. Too bad we didn’t manage to guess the new name correctly. There was only one commenter that managed to get it almost right: Simpanan Awan 1Malaysia, by Din. Well…close enough.